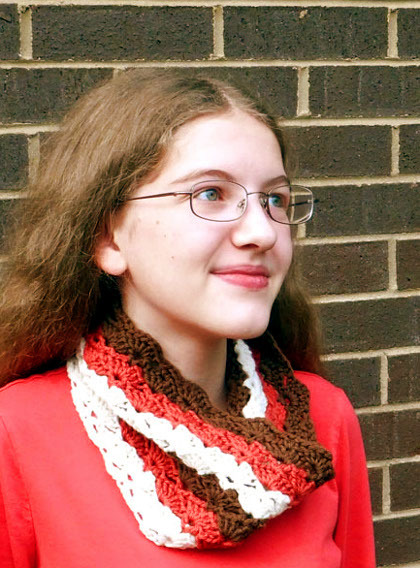 This cozy crochet cowl brings sweet colors to chilly days. The straightforward pattern of double-crochets and chains makes this piece fairly simple, and it’s quick enough to work up in time for a cold spell. While the cowl shown here is worked in a wool yarn, for an even warmer and softer cowl, try alpaca. Gauge: 14 sts/8 rows = 4″/10cm in dc. NOTE: Cascade Yarns Cascade 220 color 4146 Persimmon has been discontinued. Color 9610 Azalea makes a good substitute. 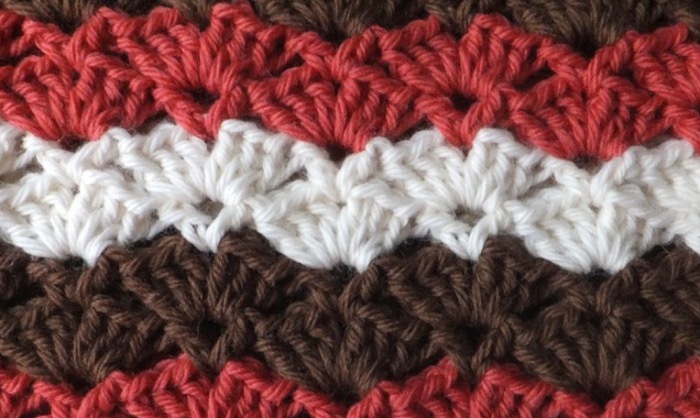 Parentheses ( ) enclose multiple stitches that are to be worked into the same stitch. 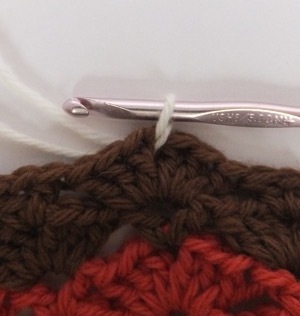 For a wider cowl, chain more stitches in multiples of 10 at the start of the cowl. Rnd 1: Ch 4, 1 dc in same ch as sl st, sk 4 ch, shell in next ch, sk 4 ch, *v-st in next ch, sk 4 ch, shell in next ch, sk 4 ch; repeat from * around, sl st in initial ch 4. Rnd 2: Ch 3, (dc 2, ch 1, dc 3) in same ch-space, v-st in next ch-space, *shell in next ch-space, v-st in next ch-space; repeat from * around, sl st in initial ch 3. Rnd 3: Ch 4, 1 dc in same ch-space, shell in next ch space, * v-st in next ch-space, shell in next ch-space; repeat from * around, sl st in initial ch 4. Rnd 4: Work as rnd 2. Working color change as previously, change to color C.
Rnds 5-6: Work as rnds 3-4. Rnds 7-8: Work as rnds 3-4. Rnds 9-10: Work as rnds 3-4. Rnds 11-12: Work as rnds 3-4. 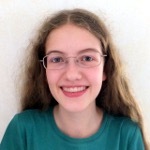 Sarah Gomez is a young Christian crochet and knitting designer. When not absorbed by fiber, she likes to read. Her designs can be found on her website, aLittleBitToKnit.com, and on Ravelry (username: aLittleBitToKnit).